Since it opened shop three years ago, Brooklyn’s Ample Hills Creamery has been making ice cream from scratch, winning over the hearts of New Yorkers with outrageous flavors like Salted Crack Caramel and “the Munchies” (ice cream packed with clusters of potato chips, pretzels, Ritz crackers, and mini M&Ms). Here comes amazing news for ice cream fanatics everywhere: Ample Hills will begin shipping nationally next week. 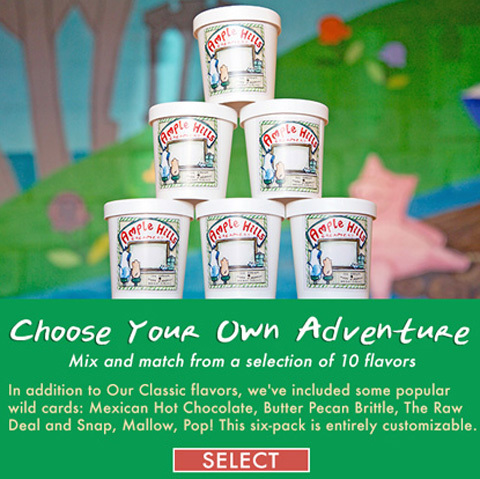 Two six-pack options will be available to get delivered to your door: a collection called “Our Classics,” featuring favorites like Salted Crack Caramel, Peppermint Pattie, Nonna D’s Oatmeal Lace, Ooey Gooey Butter Cake, Sweet as Honey, and Chocolate Milk and Cookies; and the “Choose Your Own Adventure,” which lets you create your own medley from the “Classics” and four other flavors. Six pints—delivered straight to your door—will set you back $60. Head to amplehills.com to order.